Free s'more gelato at the Ritz in Georgetown. Last winter, the Ritz-Carlton Georgetown began offering free s'mores each evening in the lobby lounge. Now, the gratis sweet has evolved into warm-weather form: s'more gelato. 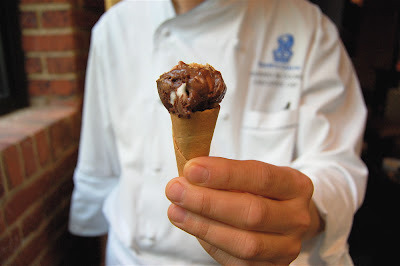 Every evening from 6:30 to 7:00 p.m., you can score free mini cones of the housemade chocolate gelato with housemade marshmallows and graham cracker crumbs. The marshmallows give it a nice chew, like a gourmet version of rocky road ice cream. Also look for samples of s'more inspired cocktails being passed.